So true to life it you will swear your loved one just pressed a finger into your pendant. Trust Dimples High Definition technology to create a treasure you’ll cherish for a lifetime. Pendant is 14mm in diameter. Engraving on back in script font, maximum 8 characters. 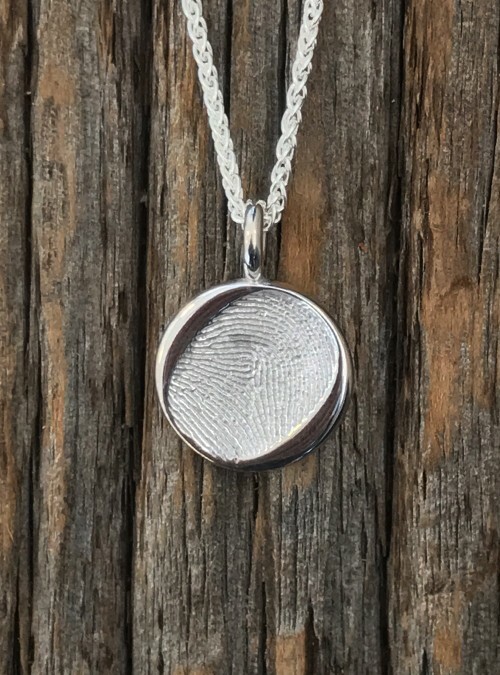 Your loved one’s fingerprint in high def on a sterling silver charm, 14 mm in diameter (the size of a nickel), with a sterling silver chain. Engraving on the back in script font. Max 1 line with 8 characters.